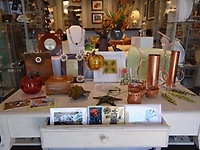 A Cooperative Cape Cod Gallery and Gift Shop in the Heart of Orleans. Visit us at 2 Main St in Orleans, Ma. We're just behind Mahoney's and next to Oceana. We are a group of 13+ Cape Cod artists and artisans who together own and operate the Coastal Craft Gallery. Everything you find in the shop is made by one of us; everyone who works in the shop is one of us.